Birds can come to be strongly linked with places in the birder’s mind. And you name many worthy candidates for a bird to symbolize the West – from the magnificent Golden Eagle to the imperiled Sage Grouse to the marvelously adapted American Dipper. But for me, the bird that best sums up my experience out here thus far is the Black-billed Magpie, a cousin of the crows and jays that makes its home all the way down the rocky spine of the continent, from Alaska to New Mexico. But again and again, as I talk to a classmate from Wyoming, a neighbor who has lived in Montana for years, the same response. No one ever admitted to me directly that they themselves didn’t like the birds, mind. It was always ‘some folks’ and then an odd look in my direction, similar to the reaction I get when I complain about the lack of delis that are open at three in the morning*. I determined to track this matter to its egg. Initial Googling revealed that the Black-billed Magpie, like so many interesting animals, once had a bounty on its head. Idaho was the state most often cited, and indeed their numbers are impressive: 150,000 dead magpies were known to have been turned in for cash, including a one-day contest where the winner shot 3400. Where there is this dedication to knocking down a species, you can usually find them eating what people would rather keep for themselves. And, in fact, the conventional wisdom behind the bounties will sound familiar to both American and British nature-lovers: Black-billed Magpies were said to eat the eggs of game birds and poultry. They would help themselves to crops and fruit trees. Having once served as tick birds on bison, they were accused by ranchers of opening sores on their cattle and causing infection. One helpful site on ‘magpie control’ (illustrated, hilariously enough, with a photo of a Northern Flicker) claimed that they would peck out the eyes of newborn and ill livestock. When one is living hand-to-mouth, it’s reasonable not to want to share food with the fauna, I suppose, although even so the zeal it would take to shoot a few thousand birds in a day seems excessive. But modern mountaineers are not living as close to the edge as all that — we are equipped with the full compliment of restaurants and grocery stores, garden centers that sell netting for fruit trees, up-to-date veterinary techniques, and a more advanced ecological understanding of our animal world than dividing it into ‘game’ and ‘varmints’. Why does the stigma persist? It seems that Black-billed Magpies also commit many of the modern, suburban bird sins. In the winter, they roost communally, forming loud congregations that get up early in the morning and spread whitewash liberally. In the summer, they defend their nests with dive-bombing vigor against outdoor cats (a sadly common species around here,) nosy children, and the like. They still enjoy a good fruit tree, and they’ve expanded their palate to appreciate a tasty dish of dog food. And sometimes it seems that their very intelligence offends. When the magpies work together to get at a food source (maybe a cute little duckling, maybe a heap of kibble) they are accused of being devious. When they swoop and mob a threat, they’re called bullies. What can I say? Everything I read about them just makes me like them more. *I get a craving for sandwiches, ok? I have to admit, Carrie, that I feel the same about Magpies and also Blue Jays. Both are bullies. I put out food for squirrels, and the birds scare them off so they can’t eat. It’s that way in this world: we have bullies and we have those who are bullied. @April – It’s funny you should say that, because so many of the people I know who feed birds think that squirrels are bullies. It’s all in the game, one might say. Great article , made me want to make plane reservations and head west to experience the Black-billed magpie first hand. I certainly have a renewed appreciation for such a cool bird! I put out birdseed for the birds and happily feed the squirrels and chipmunks with it. 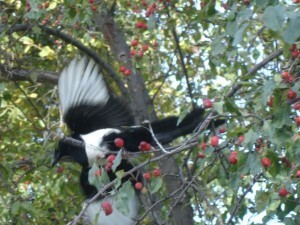 If I lived out west I would also happily feed magpies.I can’t think of any bird or critter I would not welcome. When we were visiting in Colorado this summer it was a rare treat to see magpies. Apparently, in the magpie department, I’m one up on Corey. Love Magpies. I feel so grateful that here in California we get to see the amazing Yellow-billed Magpie. I came upon a roost of Black-bills in Nevada once along a river at dusk. Watching them settle in for the evening was REALLY cool! Magpies, like their cousins the jays and crows and ravens, are smart which I think causes them some trouble, too. Though, if we listen to Olli from the comment up above, we’re even because I did see them in Kazakhstan! Underdogs and villains deserve all the love we can give. Hey, are we going to see more pictures from Missoula now? I ENJOY EVERY FALL PUTTING THE DEER CARCASS OUT IN MY YARD TO ATTRACT THE MAGPIES, AS THEY ARE VERY ENTERTAINING TO WATCH. THIS YEAR I HAVE NOT SEEN ONE MAGPIE. HAS THE HUMAN RACE KILLED OFF ANOTHER SPECIES OF BIRDS?